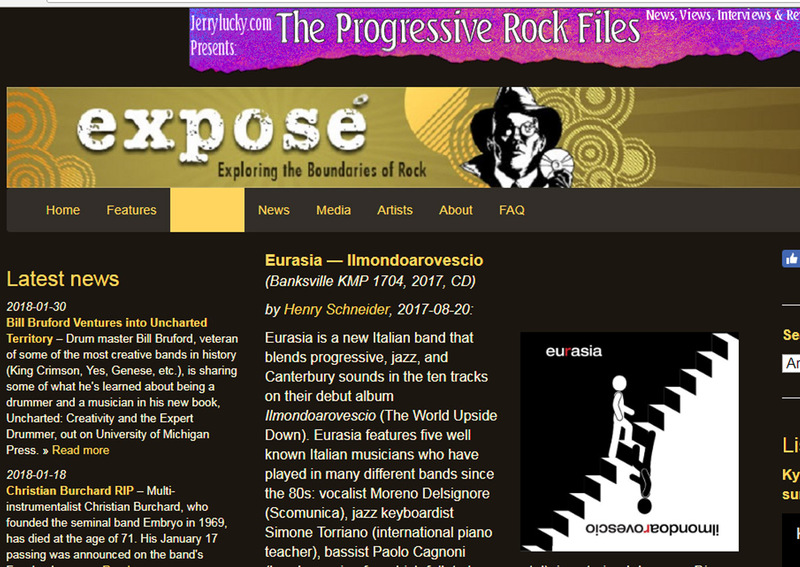 Eurasia is a quintet (+ guests) of experienced musicians hailing from Piemonte in the north-west of Italy, Ilmondoarovescio (meaning “the world upside down”) is their debut release. Across the album’s ten tracks, every member gives 200%, the result being an amazing combination of chops, power, original compositional ideas, and outstanding arrangements, bringing together elements of rock, jazz-rock, with touches of pop, folk, and avant-garde, all in a respectful progressive rock style that puts them on a level with many of the best Italian bands going back to the early 70s. The five came together from the short lived Cometa Rossa Band (which should give the reader some idea), from that experience Eurasia was born. Out front is multifaceted singer Moreno Delsignore, with an amazing range and power, sings exclusively in Italian, and it takes a listen of the entire album to understand his capabilities and power. Guitarist Marco Cavallo understands well how to support a singer like that, as well as when to let the notes rip in amazing solos, or to touch the listener’s soul with beautiful acoustic work. Simone Torriano is their keyboard man, punctuating on piano, then filling with electric piano – often providing hints of the Canterbury sound, and numerous other keyboard sounds to give the band a full melodic sound, there’s a lot here and he gets it right, always. The rhythm section of bassist Paolo Cagnoni and drummer Diego Marzi have a tasty way of giving every song exactly what it needs, either as bottom end support or as part of the arrangement. The opening of the secont cut “Fatti i Fatti Tuoi” (“get your own business”) illustrates the rhythm section’s skills well. Guest players provide additional keyboards, trumpet, even a string quartet on the closing track “Sorano Tamoto.” Their capability of blending all of these diverse elements into their sound seamlessly, and at the same time not sounding like anyone else out there right now truly makes them stand out from the pack.